Il Foglio recently interviewed Archbishop Ranjith, Secretary of the congregation for Divine Worship, on Summorum Pontificum. A reader of New Liturgical Movement has kindly translated the article. 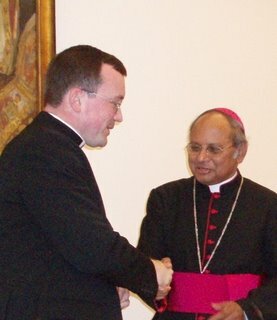 "I am certain that above all the bishops, who at the moment of assuming their episcopal ministry have professed their complete loyalty and obedience to the Supreme Pontiff, will accept this decision with sentiments of generous collaboration and will safeguard the faithful implementation of the instructions of the Motu Proprio in the manner in which it is assigned to them, respecting the specific identities of the two manners of celebrating. "I see that generally, the Motu Proprio has been well received. In any case, to speak of this as a move against the II Vatican Council would not only be a complete misapprehension, but also an attempt to create divisions in the Church. I don't see any reason for such alarmism." "It's an interesting phenomenon, this demand by the young priests. To me it is a sign of the times and the II Vatican Council advised us to always be attentive to these signs. I see a strong thirst among them to be true to the demands of their vocation. The youth of today who decide to become priests make a choice which entails perhaps more sacrifices than those of yesterday. When we entered seminary, for instance, the atmosphere was more religious than today. I see that in some cases, this search leads them to choose a more traditional sense of the liturgy, to wear the cassock or some priestly or religious insignia, and to be ready to make other choices indicative of their vocation. "This should not signify a condemnation of others who maybe have thought not to insist so much on these external apsects of their identity. But the times change. The youth want more coherence. The enthusiasm of the youth is always encouraged, not disregarded."